Executive Summary - The business version of the highly rated Starwood Preferred Guest credit card from American Express. What you get from the business version is "OPEN from American Express", which is a network of merchants where you can get discounts when you make purchases from them with this card. With the ability to transfer points to over 30 airline frequent flyer miles, this card should form the bedrock for small business owners who travel a lot. Summary - The Starwood Preferred Guest(R) Business Credit Card from American Express is a great credit card not just for Starwood Preferred Guest members, but also to those who would like to earn frequent flyer miles with this card. Find out more about this card. Key Features of Starwood Preferred Guest Program - The Starwood Preferred Guest program has the least restrictive award redemption policy. There are no blackout dates, unlike most other hotel reward programs. 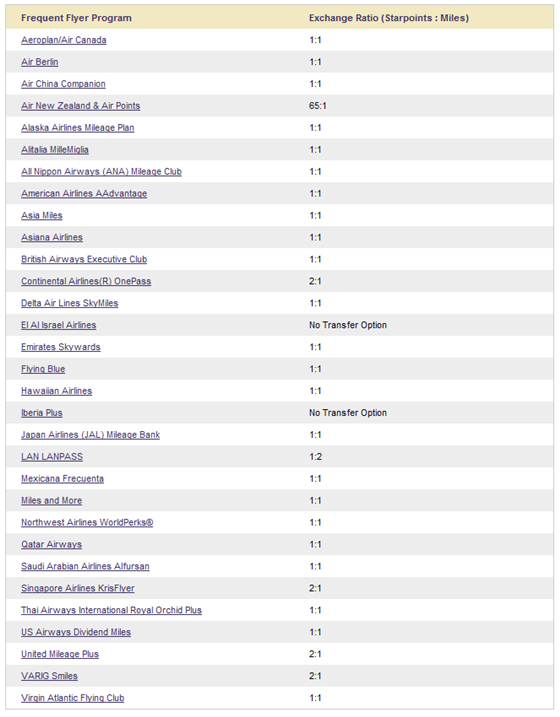 Starwood Preferred Guest also allow members to exchange points for air miles (see chart below that was taken from Starwood's site). You even get an additional 5,000 points if you transfer 20,000 points into air miles. 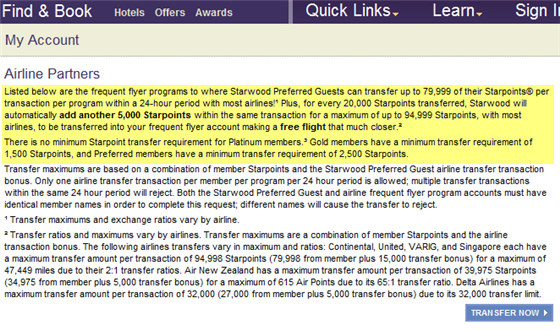 Hence, many Starwood credit cardholders simply use this card for air miles. If all you do is spend $20,000 on your card (without spending a single cent at starwood hotels), you can convert your 20,000 points into frequent flyer points. With Starwood topping it up with 5,000 points, that means you you can get a free airline ticket for a economy class roundtrip within the continental US with most airlines. If you do not want to exchange points for air miles, you can use your starwood points for for flights if you book with Starwood. This program is called starflights. 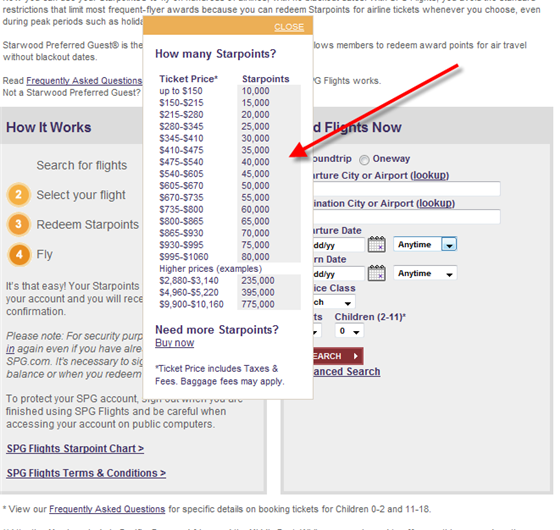 With starflights, you need a fixed amount of points to redeem for an airline ticket with value within a certain range. As most credit card reward program do not offer this feature, it becomes even more valuable. Open Savings - As part of the OPEN Savings network, cardholders can get discounts from OPEN merchant partners. If you look carefully, you will realize that Marriott Hotels is one of OPEN's partners. That means you will get 5% discounts when you use the Starwood Card to pay for a Marriott Hotel stay! Verdict - We recommend the Starwood Preferred Guest(R) Business Credit Card from American Express to the business owner who stays frequently at Starwood Hotels or who wants to earn frequent flyer points with a credit card.